As any other RF transmitter, the RFM23BP modules used in OrangeRX creates a certain amount of harmonics. Harmonics are unwanted emissions on frequencies which are multiple of the main (fundamental) frequency. If the generated waveform was a perfect sinusoid, there would be no harmonics at all. The harmonics can be seen as a measurement of the signal distorsion in comparison the a perfect sinusoid. The harmonics level is usually expressed in dBc, which is a measurement in comparison to the power of the fundamental frequency peak. We can measure the harmonics by connecting the transmitter to a spectrum analyzer via a coaxial cable, and if necessary an attenuator of known value. The ‘peak table’ at the bottom of the screen summarizes the peaks measurements. The fundamental frequency is at 25.15 dBm. We can convert from dBm to mW and find 327 mW output power. This is not a surprize as we know the RFM23BP module is powered at 3.3V in the OrangeRX 1W TX, and doesn’t provide its full power. The second harmonic is at -5.06 dBm, which means (-5.06 dBm – 25.15 dBm) = -30.21 dBc if we want to compare to the fundamental frequency. The third harmonic is at -25.64 dBm, or (-25.64 dBm – 25.15 dBm) = -50.79 dBc in comparison to the fundamental frequency. Does this correspond to the module’s specifications ? 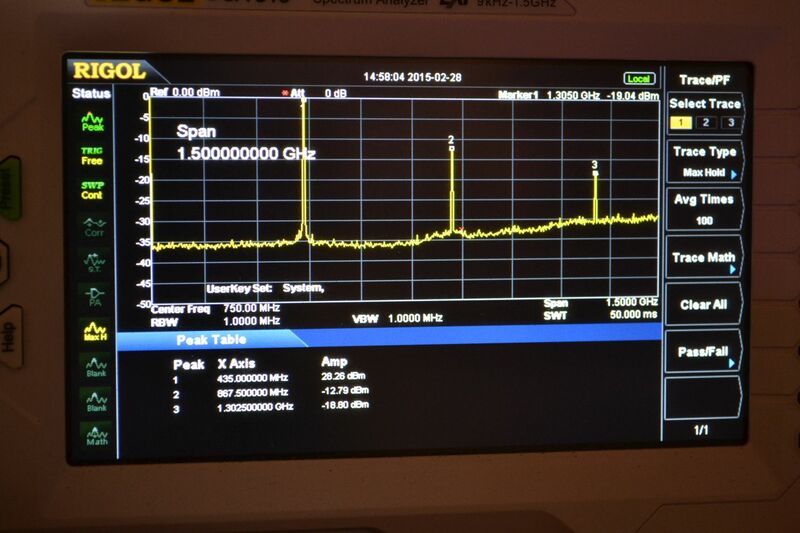 The second harmonic is below 1Ghz, so we must have something smaller than -30 dBc, and we have -30.21 dBc, which is good. The third harmonic must be better than -36 dBc and we have -50.79 dBc, which is much better. The module is perfectly compliant to its specifications in regards to harmonics level. Decibel (dB) is a way to express a ratio between two values. For example if value A is 100 times greater than value B, their ratio is 10 dB. dBc is a way to express the ratio of an harmonic in comparison to the fundamental frequency. For example if second harmonic is -30 dBc, it means that it’s 0.001 of the fundamental frequency’s power. If you’re interested you can find more information here. Again, this module is compliant to its specifications. We will now compare to another device using a RFM23BP module. The interesting fact about this device is that it contains a lowpass filter to reduce harmonics level. Another difference is that it powers the RFM23BP at 5V rather than 3.3V. First we can notice the higher output power of 28.26 dBm = 669 mW. It provides an improvement of 28.26 – 25.52 = 2.74 dBm. It’s normal not to find 1000 mW, because the RFM23BP is powered at 5V (max power is at 5.5V), and the filter gives an insertion loss (about 1dB). Notice that the filter will slightly attenuate the output signal, but also the input signals. 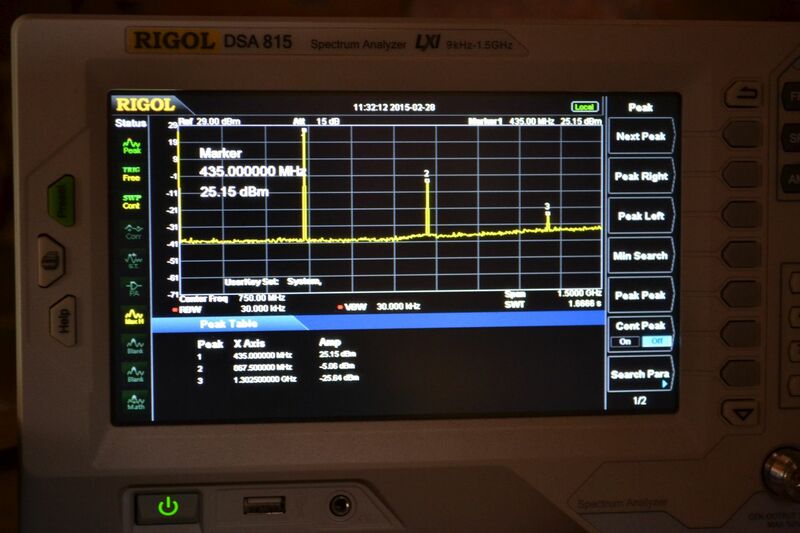 Then the second harmonic (870 Mhz) is at -12.79 dBm, which is much better than what we had without filter (-4.52 dBm). 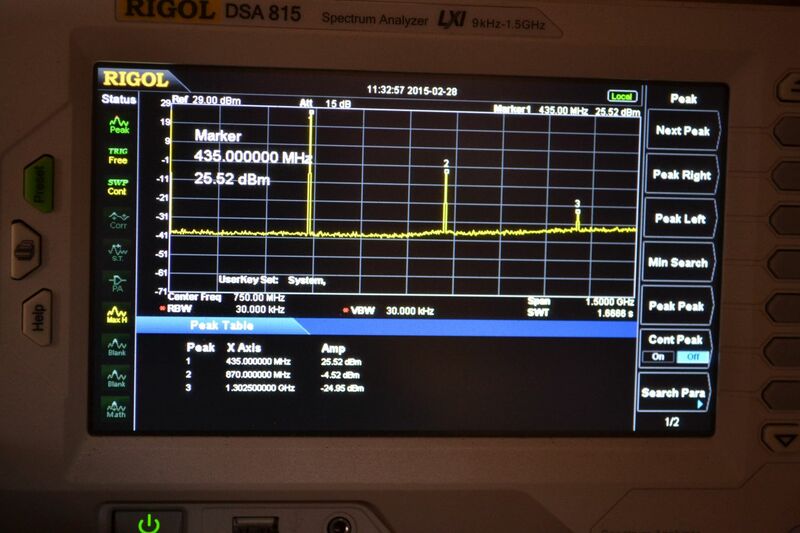 The third harmonic (1300 MHz) is at -18.80 dBm, or -47.06 dBc. This means that this device creates more interferences to 1.3 GHz video than the OrangeRX modules do. For this frequency, it doesn’t correspond to the lowpass filter’s specifications, so the exact cause has still to be determined (defective filter ?). However it was possible to confirm the measurement by testing the interference on a 1.3GHz video RX, and comparing with an OrangeRX module. I noticed their spec for spurious emissions from 1 to 12.75GHz says, “excluding harmonics”. That sounds like they’re only specifying noise other than harmonics and not putting any limits on their harmonics in that range – doesn’t make sense. Agree with you, that wording doesn’t make sense as we expect to find something only on harmonics. But according to my measurements they respect the datasheet levels for the harmonics, so that’s good. I suspect they have installed filter backwards? That’s very likely, I don’t see exactly what else could cause the result measured.